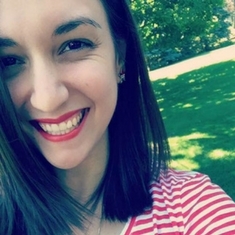 Happy August everyone! How are you all doing today? I'm doing great! Today I have a swatch post for you all! That's right, a swatch post....no nail art. I've toggled with the idea of swatching on here for the longest time. Over the past few months, a few of my posts have included swatches which have pretty much been the bases for my nail art. I liked how the pictures turned out, and I got a lot of positive comments, so I thought I would give it a go. Today I am sharing with you the new FingerPaints Fast Dry collection, which is available now through October at Sally Beauty. Now, I always thought that my FingerPaints polishes dried fast, but they have nothing on these babies! 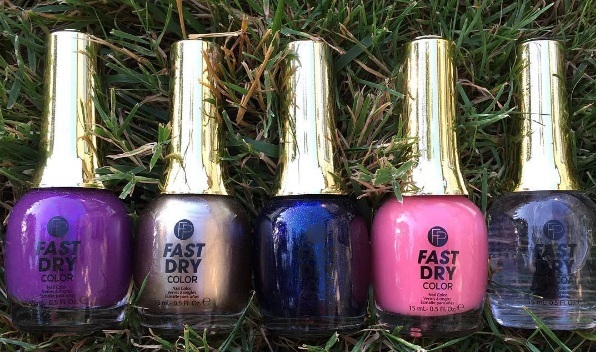 The Fast Dry Collection comes with four colors: Pronto Purple, Champagne Gold, Fathom Blue, and Cool Coral. 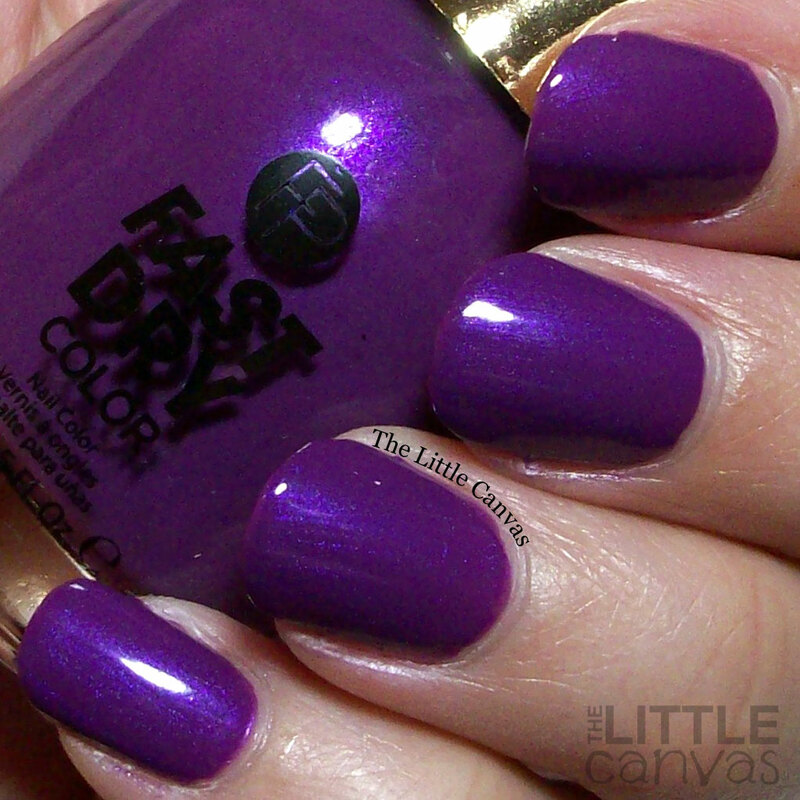 There also is a Fast Dry Top Coat to seal your color in and add extra shine. Let's take a look! First we have Pronto Purple. Such a gorgeous deep purple with a blue shimmer. The shimmer was faint in the bottle, so I didn't think that it was going to translate on the nail but I was wrong. Two coats for full coverage. Lovely shade. Next we have Champagne Gold. 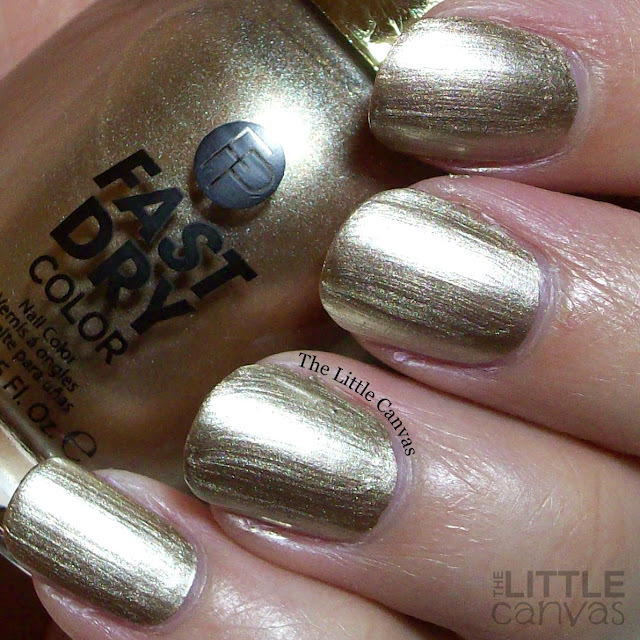 This is a gorgeous metallic gold shimmer polish. One coat. Yes, you read that right, one coat. I debated on putting two, but it really did not need it at all. Very easy to apply. Sometimes these chrome-like metallic can be streaky, but this has an amazing formula. 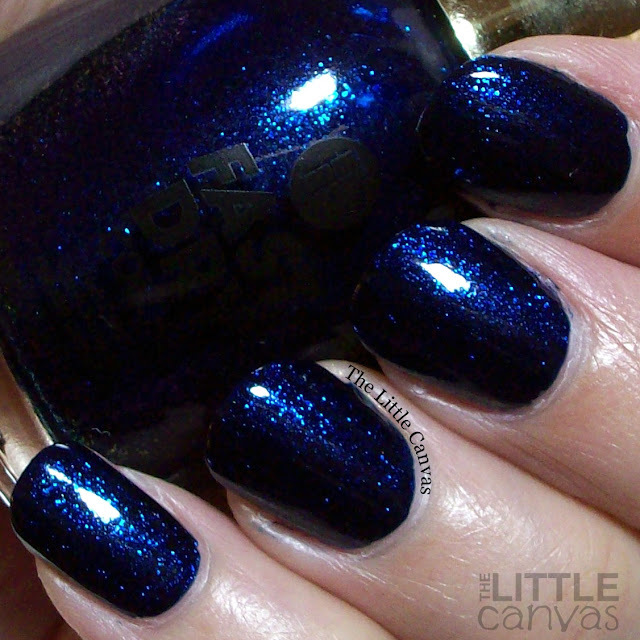 This lovely, beautiful, stunning polish is Fathom Blue. LOVE this one! You can get full coverage with one coat just like Champagne Gold, but I used two for the swatch above. The bottle has a slight purple shimmer, but I couldn't pick that up on camera. What I could pick up was the gorgeous depth that this polish has with the sparkle. Last but not least, we have Cool Coral. 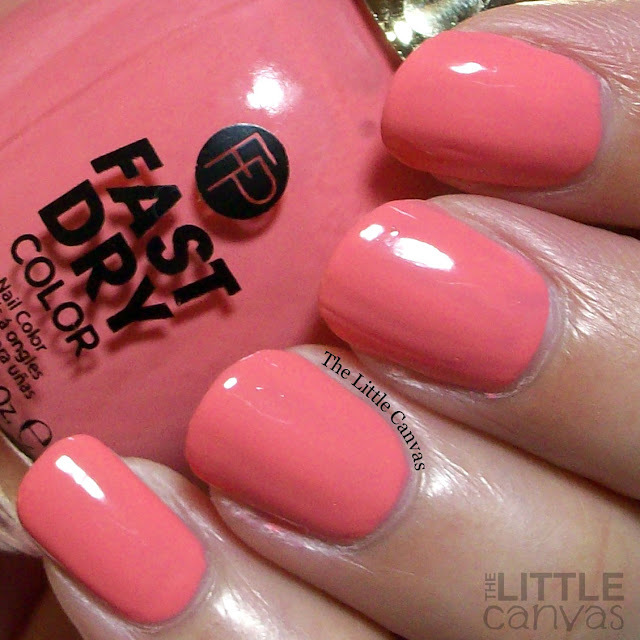 Lovely coral shade which required two coats. No way could you get away with one on this, it was kind of watery in comparison to the others. It built up nicely though with two and didn't streak or pull like others with similar formulas. I think this might be a good summer pedicure polish. My favortie from this collection is Fathom Blue, with Champagne Gold coming in a close second. At first I thought they were going to be similar to other polishes I owned, but they are very unique to my collection. 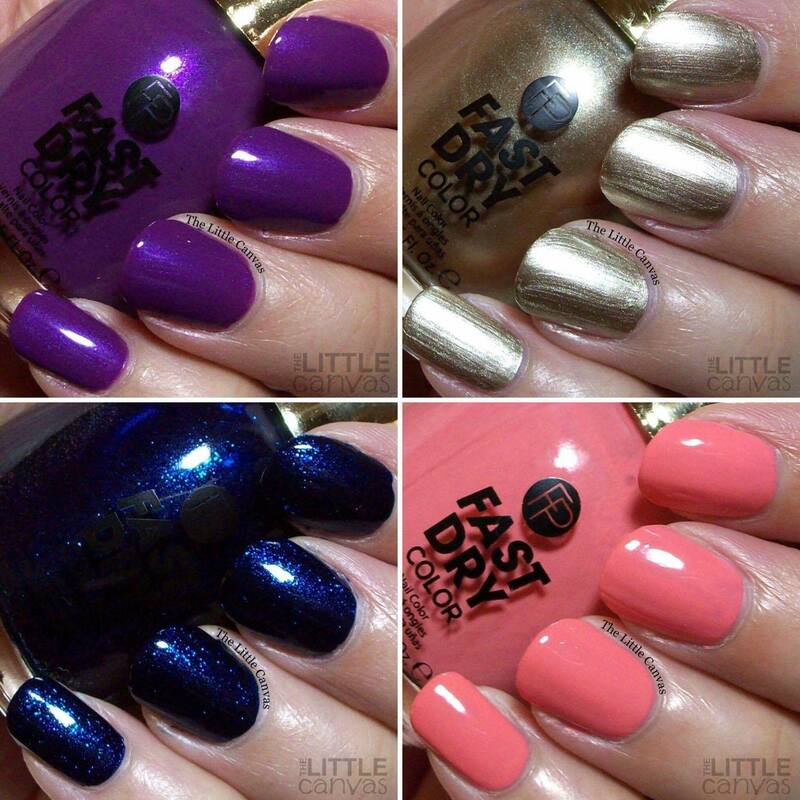 All polishes did live up to the Fast Dry name. I start painting my index finger then move to the pinkie. By the time I got to my pinkie nail, my pointer was completely dry and ready for the second coat. Quite impressive if you ask me. What do you think? Fan of this collection? Like that I did a swatch post? The FingerPaints Fast Dry Collection is available online and in store at Sally Beauty Supply from August through October. Make sure to head over and grab yours today! You all need to at least have Fathom Blue!